The 1960s. Neil Armstrong walked on the moon. The Chinese cultural revolution began. The first series of Star Trek was aired. 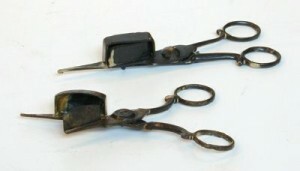 MERL acquired object number 60/1/1-2, a pair of candle snuffers from Binfield. I know this because we have just finished cataloguing every object accessioned to the Museum in the 1950s! 60/1/1-2: Candle snuffers from Binfield.